4. WHO IS BAGGER VANCE? 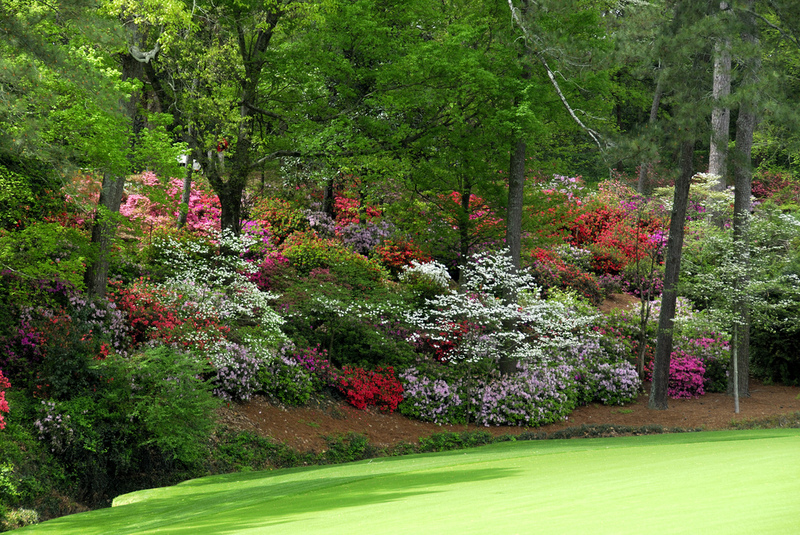 Augusta National Golf Club, envisioned by Bobby Jones in 1931, is known for its gorgeous flowers (like azaleas) which are in full bloom during "The Masters" golf tournament. The golf course was formerly the site of Berckmans' Place (and the father-and-son-owned Fruitland Nurseries). Among his many horticultural contributions, Prosper Berckmans popularized the azalea. Follow both links in this description to learn some very interesting history about "The Masters" and its hosting golf club. Image online, Ticket City. Bobby Jones was a "marvelous" golfer. Although he played tournament golf for a relatively short time (from the 1916 U.S. Amateur, at age 14, through the 1930 Grand Slam, at age 28), he made his mark as one of golf’s greatest players. Also a lawyer, Bobby practiced law with his father, in Atlanta, after he ended his years of tournament matches. Bobby was a short, rotund kid, with the face of an angel and the temper of a timber wolf. At a missed shot, his sunny smile could turn more suddenly into a black storm cloud than the Nazis can grab a country. Even at the age of 14 Bobby could not understand how anyone ever could miss any kind of golf shot. By the 1923 U.S. Open, Bobby Jones had conquered his biggest stumbling block - himself - and had found his single best weapon - his will to win. He performed best when most people perform worst: under extreme pressure. After he left competitive golf, Bobby Jones played only one tournament a year - the Masters. He had a particularly good reason for favoring that spring event. It was Bobby who believed that Berckman's Place - in Augusta, Georgia - had the potential to become one of the world's most-beautiful golf courses. His vision began to take shape in 1931. When he retired from tournament golf, with 13 major titles, Jones held a record which lasted 40 years. His dream golf course, and the Masters tournament it annually hosts, has impacted golfers and their fans for more than 80 years. It is against these two formidable champions (Jones and Hagen) that the liquor-drinking, war-weary Rannulph Junah must play the golf match of his life. And ... he isn't up to it. At least, he doesn't think he is. Bos, Carole "BOBBY JONES" AwesomeStories.com. Nov 01, 2000. Apr 23, 2019.